existing installations without disconnecting power conductors. Image courtesy Absolute Process Instruments, Inc.
Electrical machinery and devices are everywhere throughout commercial and industrial settings. Motors are found on a countless variety of machines, including compressors, pumps and conveyors. Electric heating is employed in many production processes, as well as being used as freeze protection for piping systems located in the cold. Gathering information on the operational health of electrical equipment can often be accomplished continuously and in real time, simply by monitoring the electrical current flowing to the utilization equipment. Two common examples of how electric current monitoring can provide information helpful to operators come to mind. Motors driving pumps, fans, air compressors and refrigeration units often have very predictable load ranges that are reflected in the operating range of the motor current. Deriving a process signal the corresponds to motor current enables the operator or automation system to confirm that the motor is operating on command and within its expected load range. Operation outside of the expected range can be cause for concern and prompt an appropriate response. Electric heaters for process control, freeze protection, HVAC and other applications will present very predictable levels of operating current. Again, a current measurement can confirm that the heater, or multiple heaters, are operating on command. The questions of whether electrical equipment operates when a run command is initiated and whether it is operating properly (within its expected range) are basic and essential bits of information for any process or equipment operator. For many types of electrical equipment, a process signal corresponding to electrical current provides useful answers to both questions. Deriving the process signal for electrical current and delivering it to a local or remote control or automation system is a simple task. Whether installing new equipment wiring, or retrofitting to existing cables, there are standard products for a broad range of applications. Some basic features deliver everything needed. Implementation is very straight forward. Mount the transmitter in a location where the power conductor can be routed through the sensing core of the unit. 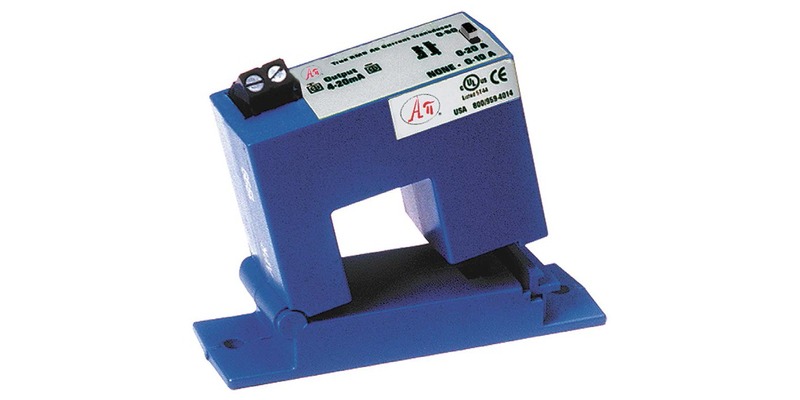 These transmitters function in a similar fashion to a clamp-on ammeter. The conductor being measured must pass through the sensing unit. Select the appropriate range for the application with jumpers or switches on the unit. The 4-20 mA output signal will correspond to the selected measurement range. Connect the signal cable to create the 4-20 mA loop and you are ready to go. Solid core units require the power conductor to be passed through the sensing portion of the unit, so the conductor must be disconnected from the circuit at one end and routed through the unit. If this is not practical, a split core unit can be used. The split core is hinged, and opens like a clamp-on ammeter, allowing installation of the transmitter at any point along the conductor without the need to disconnect. Share your electrical equipment monitoring requirements and challenges with process measurement specialists. Leverage your own knowledge and experience with their product application expertise to develop effective solutions.